Bust your way to freedom with our in-depth guide to this match-three masterpiece. We lost pretty much our entire weekend to EightyEight Games' incredible 10000000. 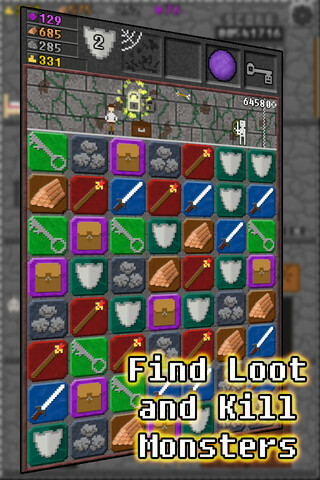 Not only is it a fantastic match-three puzzler, it also throws in some incredibly addictive RPG and endless-runner elements that have kept us coming back again and again. We awarded the game a very well-deserved 4.5 Stars out of 5 in our review yesterday. If you're struggling to get your tower back in good shape, we've put together everything we've learned from our time with the game to give you a powerful advantage as you run, blast and refine your way to well-earned freedom. During that precious running time when you don't have an obstacle to deal with, it's absolutely critical that you keep on matching stone and wood as quickly and as frequently as possible. 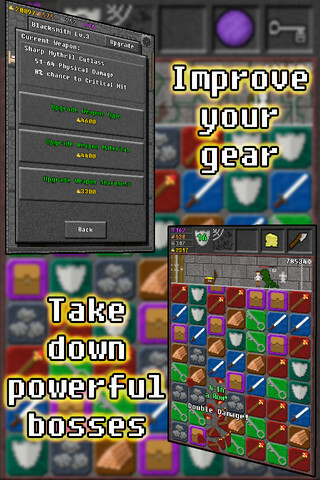 Not only does this help you acquire the materials that are necessary to upgrade your tower and become more powerful, it also increases the chance of getting hold of the weapons and keys that you need to keep pushing on. If you have no stone or wood matches available, get your eyes on potential key or weapon match-ups while you're still running. You don't want to use these up before you reach the appropriate obstacle, so resist the urge to just blast away at the matches. You may find your turn ending sooner rather than later if you do. The more weapon blocks you can match up, the more damage you'll do with each strike. From the perspective of efficiency, matching four blocks should always be the ideal goal until you reach the very end-game. Not only will four do enough damage without wasting any power on over-kill, getting four keys in a row will blast through both locks on a chest or door. Why struggle to do two key match-ups when one big blast will do the same job in a much quicker time? If you see a glowing red enemy up ahead, expect a serious challenge. At this point, you should be getting eyes on every possible weapon match-up, focusing on matching more than three at a time, and clearing out as many stone and wood tiles as possible to encourage more weapon tiles to cascade downwards. As well as keeping an eye on the board and upcoming challenges, you can also slide the tile into the match position before you reach your target. The blocks won't match until you take your finger off the screen, and this can gain you precious game-saving seconds. If you're really in a pinch and desperately need new tiles on the board, we strongly recommend going for vertical column match-ups wherever possible. Why vertical? Well, if you clear a row you stand less chance of bringing more tiles into closer proximity to matches. A couple of well-timed vertical drops can completely change the board for the better. Of course if you're really stuck, don't be afraid to waste weapon match-ups when faced with doors or chests. You can't score if the game ends, so you might as well do everything you can to increase your chance of getting some key tiles on the board. While it's tempting to simply smash away and overkill a particular enemy, you don't want to leave yourself unarmed for an upcoming fight. Don't get into such a killing frenzy that you waste a critical weapon match before you've even gone toe-to-toe with the next enemy. Here's a breakdown of what each tile is used for. Both of these items are necessary for upgrading the rooms in your towers. You should be matching these constantly so that you're never short of materials, and always bringing more immediately useful tiles onto the board. 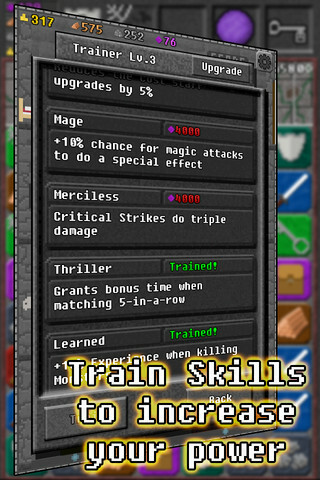 The points you earn from these are used in the gym to add special bonuses to your stats and performance in the dungeon runs. Essential for opening treasure chests and doors. Match four or more to force open a double lock in just one match-up. These provide you with a defensive advantage against enemies. As with stone & wood tiles, you should be matching these whenever you have an opportunity between obstacles. These are your magical assault match-ups. 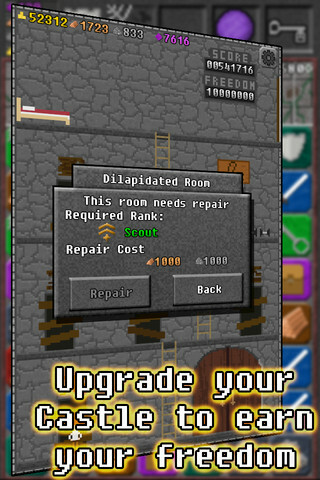 Upgrade the damage by visiting the Staffmaker room in the tower once you've unlocked it. Swords are responsible for your melee damage. You can upgrade the weapon and improve your damage at the Blacksmith.